In the medieval period, the royal wardrobe – that is, the splendid robes and other clothes worn on state occasions – were kept at a range of different locations including the Tower of London and Westminster Abbey. 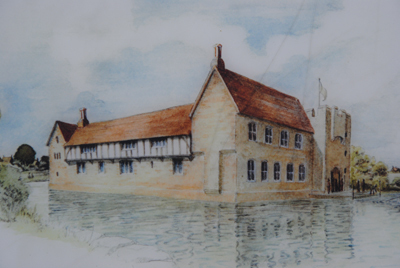 In the 1360s, however, it moved to a more permanent location in what had been a house near Blackfriars priory. 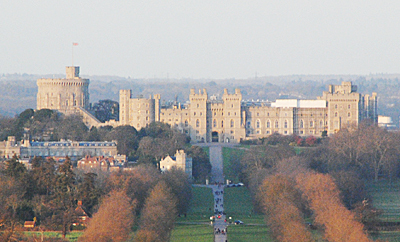 Sold to King Edward III by the executors of the will of Sir John Beauchamp, the house served as the key storage site for royal clothes including not only those of the monarch but various people attached to the court such as the royal family, king’s ministers and Knights of the Garter. 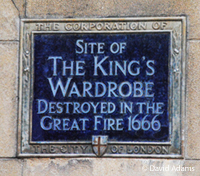 The building, which was considerably extended over the years to include everything from a great hall and chapel to stables, was destroyed in the Great Fire of 1666 and the wardrobe was moved to another building in Buckingham Street although by this stage its importance had declined considerably (the last Master of the Wardrobe held office in the late 18th century). Its name lived on in that of the church St Andrew-by-the Wardrobe and that of the well-hidden and intimate Wardrobe Place (it’s located between St Andrew’s Hill and Addle Hill). 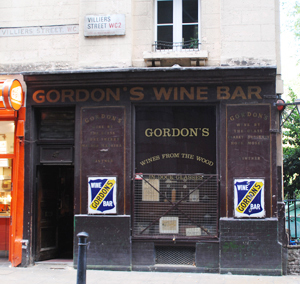 There is a blue plaque which marks the site of the former building (pictured above). One of 12 casts made of an original which stands in Calais, France, this sculptural group commemorates one of the most poignant moments of the bloody Hundred Years War. The original work, by the renowned Auguste Rodin who beat five others with his design, was completed in 1889 and stands outside Calais’ town hall. This cast was produced in 1908 and presented to the nation in 1914 by the National Art Collections Fund. It stands in Victoria Tower Gardens, just to the south of the Houses of Parliament in Westminster. The sculpture commemorates an event which took place in 1347. Calais, then, as now, an important French port, had been besieged by the English for more than a year and, in a desperate situation as the townspeople starved (and despite orders from the French King Philip IV to hold out), the city authorities were seek terms from the English king, Edward III, still flushed with the success of the Battle of Crecy the year before. Edward’s conditions for their surrender were harsh – six of the city’s leaders had to be handed over and the rest of the city would be spared. But more than that, the six had to leave the city stripped of almost all their clothes, wearing nooses around their necks and carrying the keys to the city and castle. Six burghers, led by Eustache de Saint Pierre and also including John Daire and brothers James and Peter Wisant, did so and it is the scene of them making their way to King Edward that Rodin has captured. Their bravery was rewarded – while King Edward apparently order them to be beheaded, his pregnant English Queen, Philippa of Hainault, intervened on their behalf and they were spared execution, dressed and fed before they were safely escorted away. Only 12 casts of the group were ever permitted under French law – the London cast was the third to be made. We’re yet to take an in-depth look at Old St Paul’s Cathedral – that is, the building that stood on the existing site before being destroyed in the Great Fire of London in 1666 – but today we thought we’d focus on just one aspect of the former church – the old chapterhouse. 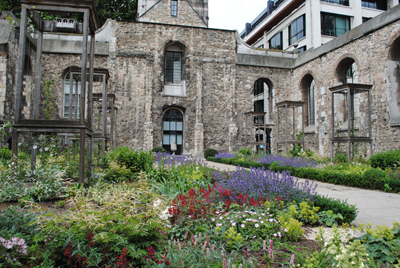 Located in the South Churchyard on the Thames side of St Paul’s Cathedral, the location of the chapterhouse is today marked out by raised stonework (the actual building remains lay a few feet below) which can be freely accessed from the street. 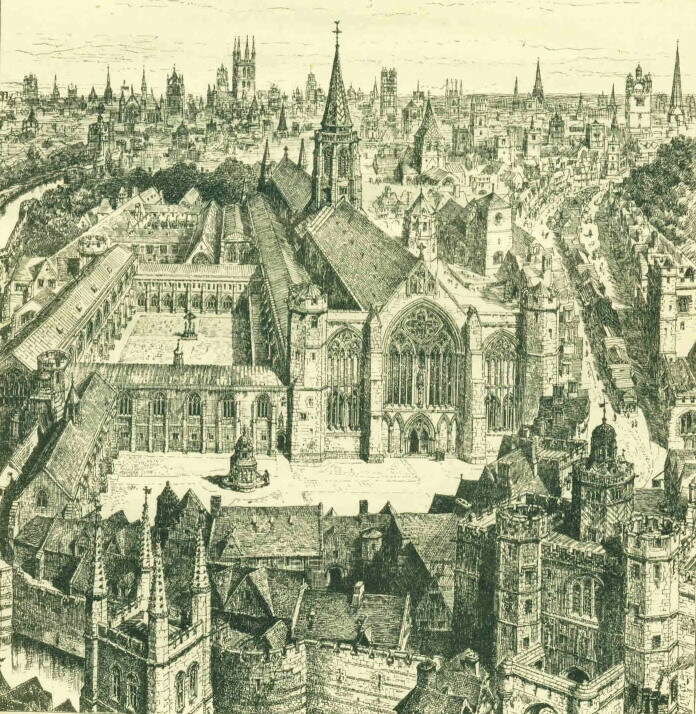 The octagonal chapterhouse, which replaced an earlier chapterhouse, stood in the middle of a 100 foot square arcaded cloister, both of which were designed by the royal mason, William Ramsay, in 1332 during the reign of King Edward III, in one of the first known examples of what is referred to as the ‘Perpendicular Gothic’ style. Designed as a two-storey building for better air circulation, the actual chapter room was located on the second floor of the chapterhouse over an undercroft below and it was here the monks would meet daily to discuss affairs relating to the cathedral (the word chapterhouse comes from the fact that it was while in this room the monks would be a read a daily chapter from the body of rules governing them). The marked out chapterhouse (pictured above – the chairs are standing inside the chapterhouse) was unveiled in 2008 following a £3.8 million redevelopment of the South Churchyard, itself part of the bigger, recently completed, overhaul of the entire cathedral). 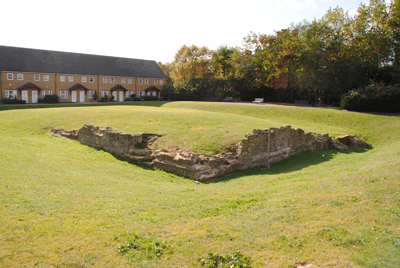 The remains of one of the lesser known former royal residences in London, King Edward III’s manor house, sit amid a grassy park on the south bank of the Thames at the corner of Bermondsey Wall East and Cathay Street in Rotherhithe. Believed to have been built in about 1350 during the reign of the king (1312-1377), the 14th century property – which consisted of stone buildings arranged around two courtyards – was originally built on what was then an island surrounded by marshes. The premises was surrounded on three sides by a moat – the fourth side opened directly to the river, allowing the king to travel to the property by boat. Among the buildings in the complex were a hall with a fireplace as well as private chambers for the king and utility spaces like kitchens (pictured below is a reconstruction of the property as depicted on an information plaque located at the site). The function of the building remains somewhat a mystery – with no nearby royal parks it is unlikely it was a conventional hunting lodge although documentary evidence does point to falcons being house there so perhaps it was a place where the king hunted with falcons. As the Thames riverbank was pushed northward over the following centuries, the residence became completely surrounded by a moat. It was eventually sold into private hands. The site was apparently used as a pottery in the 17th century and warehouses occupied it in the 18th and 19th centuries (in fact a 14th century wall was incorporated into one of these and was still standing in 1907). The warehouses were demolished in the 1970s and the remains of the palace confirmed on the site during an excavation by English Heritage 1985 (they also found a lot of Delftware on the site apparently related to its days as a pottery). Look a little deeper and you’ll find there’s often a fascinating story behind many of London’s seemingly odd place names. Churches are no exception and in this new series we’re looking at some of the stories behind the name. First up, it’s the church of St Andrew-by-the-Wardrobe, a rather austere-looking church which looms up over Queen Victoria Street. While the present church largely dates from after World War II – it was bombed during the Blitz and only the outer walls remain of what was there before (the previous church was itself a rebuild to the designs of Sir Christopher Wren after an earlier version was burnt down in the Great Fire of 1666) – there has apparently been a church on the site since at least the 12th century. 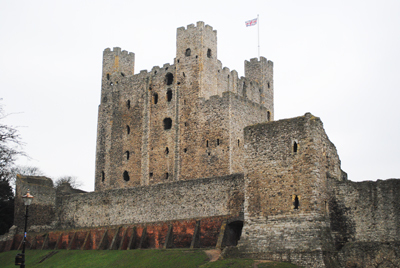 Indeed, in the 13th century it was associated with the then royal residence known as Baynard’s Castle. The church’s rather unusual name owes its origins to King Edward III’s decision in 1361 to move the Royal Wardrobe – which included his state robes and other valuables – from the Tower of London to a new building which lay near to the church (there’s a plaque in nearby Wardrobe Place marking the former location of the King’s Wardrobe which also burnt down in the Great Fire and was subsequently relocated). Hence St Andrew-by-the Wardrobe. While the interior of the church is a complete reconstruction of Wren’s original, it does still boast some early treasures including an original pulpit as well as a font and cover of Wren’s period (these come from the now long gone church of St Matthew Friday Street), a figure of St Andrew dating from about 1600 and another of St Ann (mother of Mary), who is holding her daughter who is in turn holding Jesus, dating from about a century earlier. 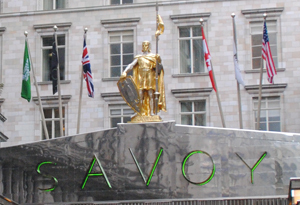 There’s also a royal coat of arms – dating from the Stuart period – which originally came from St Olave’s Old Jewry. Among the most prominent residents in the church’s parish was the playwright William Shakespeare (there’s a rather odd oak and limewood memorial to him and a contemporary composer, singer and musician, John Dowland – who was buried in the churchyard, inside). Another Shakespearian contemporary, Ben Jonson, also apparently lived in the parish. The church also has links with with the Mercers, Apothecaries and Blacksmiths livery companies. 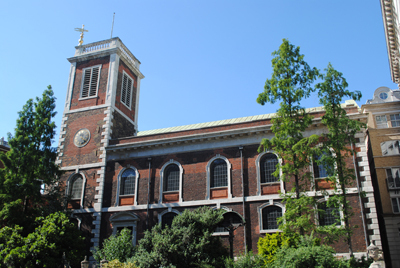 Earlier this year St Andrew-by-the-Wardrobe, which is a sister church to St James Garlickhythe (another unusually named church), celebrated 50 years since its post war reopening in 1961. WHERE: Access is via St Andrew’s Hill or Queen Victoria Street (nearest Tube stations are St Paul’s and Mansion House). WHEN: The church building and the Chapel of St Ann are normally open for visitors between 10am and 4pm weekdays while the nave is open on Fridays from 11am to 3pm (check with the church before going); COST: Free; WEBSITE: www.standrewbythewardrobe.net. Recently making news headlines thanks to the work of Adrienne Barker of the University of Dundee in reconstructing his face, Simon of Sudbury wasn’t born in London and, in fact, spent much of his early life elsewhere. But, as Bishop of London and Archbishop of Canterbury, he was a key figure in the 14th century city and it was in London that he eventually met his grisly death during the Peasant’s Revolt. Simon Theobold was born around 1316 – the son of a wealthy Norfolk merchant – and, while details of his early life are scant, it has been suggested he studied at Cambridge before eventually entering the service of William Bateman, the Bishop of Norwich. He apparently became caught in the middle of a dispute between the bishop and the Abbot of Bury St Edmunds (the details of which we don’t have time to get into here) and it was this which is said to have led to the issuing of a royal order for his arrest, a move which forced him to flee England for the papal court at Avignon. He quickly came to the attention of the popes and took on an official role, the reward for which was the income from various positions in the English church including Chancellor of Salisbury. In 1356, Pope Innocent VI sent him on a peace mission to King Edward III and it was during this mission that he came to the attention of the king. Having never been formally outlawed, he was apparently forgiven his earlier crimes and was soon acting on behalf of the king including at the Papal court. In 1361, Simon was made Bishop of London and spent the next 10 years in the role, as well as continuing to act for the king, notably as a diplomat. In 1375 following the death of incumbent William Whittelsey, he was elevated to the position of Archbishop of Canterbury. His time as archbishop was somewhat troubled – as well as facing accusations of being too close to the king, he also faced criticism over his treatment of Bible translator John Wycliffe – but it was his role in secular politics which led to his demise. Following the accession of King Richard II in 1377, in 1380 Simon was appointed chancellor, a position which meant he bore the ultimate responsibility for the imposition of an extremely unpopular new poll tax. In 1381, there were calls for his death at the outbreak of rebellion in Kent, notably when the rebels entered Canterbury Cathedral. 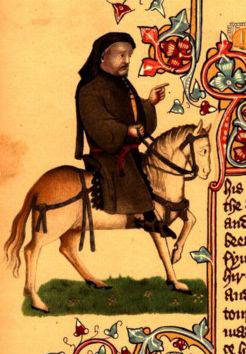 But as the crisis now known as the Peasant’s Revolt gained momentum, Sudbury remained with the king in the Tower of London where he apparently counselled a hard line. King Richard II when to parley with the traitors at Mile End on 14th June and there apparently indicated that action would be taken against traitors around him (Wat Tyler was killed when the king again met the rebels, this time at Smithfield, the following day). 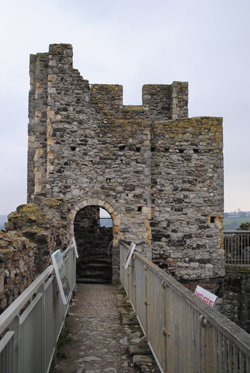 A group of rebels subsequently stormed the tower and dragged out Sudbury and the treasurer, Sir Robert Hales. Taken to Tower Hill, they were there beheaded. 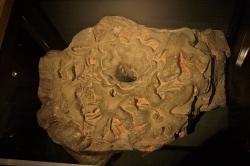 Sudbury’s head, which apparently had a skullcap nailed to his skull, was impaled on a lance and put on display over London Bridge. His body was buried in Canterbury Cathedral. The skull, meanwhile, was apparently taken down by a Sudbury man and taken back to his home town where it was kept at St Gregory’s Church. Some 630 years later, following an approach by Sudbury locals, forensic artist Adrienne Barker from the University of Dundee was asked to recontruct Simon’s head. 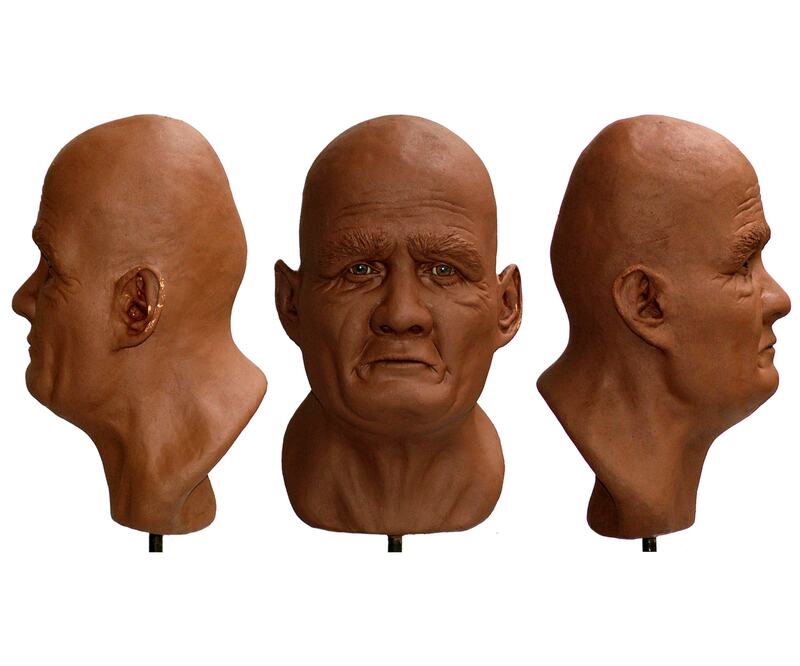 Following some CT scans of the skull, Barker – who carried out the work as part of her MSc Forensic Art studies under the tutelage of renowned facial reconstruction expert Professor Caroline Wilkinson – used state-of-the-art reconstruction techniques to recreate Sudbury’s facial features and complete a series of 3-D bronze-resin casts of his head. The models, one of which will be on permanent display at St Gregory’s Church in Sudbury alongside Simon’s skull, were unveiled in September. 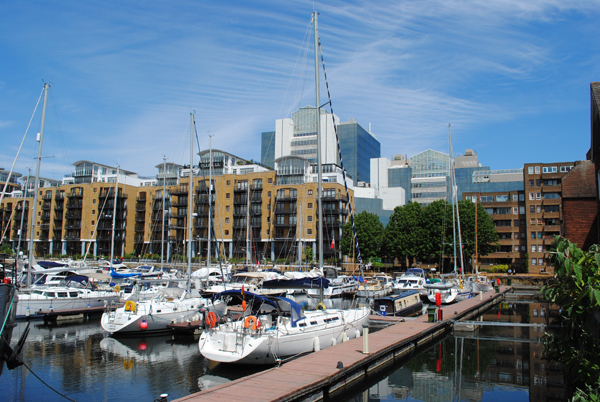 Located in a great bend of the River Thames to the east of the City, the Isle of Dogs isn’t really an isle at all but a broad peninsula of land jutting out to the south of Poplar, opposite Greenwich. Formerly known as Stepney Marsh, for centuries the area was protected by a great embankment and in the 13th and 14th centuries came to be home to a small agricultural community. 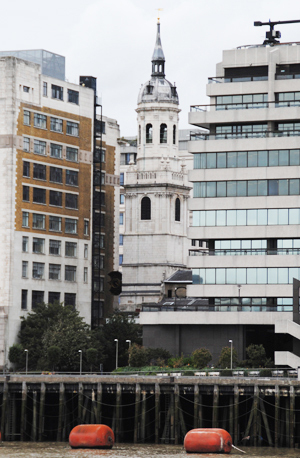 After the embankment was breached, however, the area reverted to marshland and only came back into more intensive use with the opening of the West India and East India docks in the early 1800s (amalgamated in 1838) and Millwall Dock in the 1860s. The linking of these docks in the early 1900s apparently made the “isle” an island for the first time. At the same time, the area also became noted for shipbuilding – among the vessels constructed here was Isambard Kingdom Brunel’s SS Great Eastern, the biggest ship ever built when launched in the late 1850s. The population of the area rose thanks to the docks and by 1901 – following the development of Cubitt Town, named for developer William Cubitt – the population had risen to 21,000. Heavily bombed in World War II, the isle saw a resurgence in the Fifties and Sixties but gradually declined in the following years as new shipping technologies made the docks obsolete. The last of the docks closed in 1980. The area has since been redeveloped in a project initially driven by the London Docklands Development Corporation and is now in effect a city within a city, housing homes, apartments, retail precincts and office buildings – including One Canada Square, the highest tower in London, at Canary Wharf (the highest tower in London until recently surpassed by the currently-under-construction Shard in Southwark), linked to the rest of the city via the Docklands Light Railway (DLR). But what about the name Isle of Dogs? One theory is that it was here King Henry VIII kept his hunting dogs (the earliest reference to the Isle of Dogs is apparently on a map dated 1588) while others suggest the name comes from dogs King Edward III kept there. Others have suggested the name is a corruption of ‘Isle of Ducks’, that the area is named for packs of dogs who roamed wild in the marshlands here or that it comes from the fact dead dogs washed up on banks of the Thames here. As for which is the truth? Take your pick. 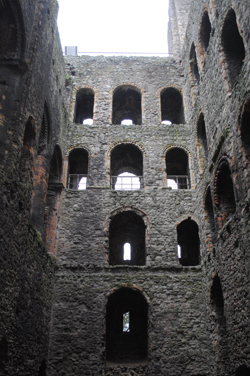 Tower Hamlets, the local authority, offers a great free walk through the area which gives you a glimpse into its history. See http://bit.ly/dRzcP9.